>Czech Republic: Is there a euro-realist in the house? > Did someone say ‘Euro-realism?’ The complicated politics of Czech European and policy formation just got a whole lot more complicated with the appointment of ‘euro-realist’ extraordinaire Jan Zahradil as the PM’s special representative for negotiations on the European Constitution. His deputy – in what Zahradil explained as an unofficial and confidential role negotiating, probing and assessing options for a future constitutional treaty – however, will be former Defence Minister (in the short-lived 1998 caretaker government) Jiří Šedivý, who, formally speaking, is the number two Minister to Alexandr Vondra, the Deputy PM for European Affairs. Interviewed, Zahradil claimed that he wasn’t actually opposed to a treaty document of some kind, possibily even included bits of the current Constitutional Treaty) and, if necessary, would bite the bullet and merely act as an intermediary for options he didn’t agree with. 1. President Václav Klaus, who has a small constitutional role in foreign policy and a larger informal role; sees ‘Europa-ism’ as a the latest compositecollectivist threat to (liberal) civilization as we know it. 4. Jan Zahradil – no introduction needed. Head of Civic Democrat MEPs in Brussels. Advocates ‘flexible integration’ as only way forward and best means to promote competition (different national economic models) rather than rather paranoid ideological rejection of EU promoted by Klaus. In practice, this integration, would be so flexible it would, – free trade aside – be almost entirely optional. 5. Jiří Šedivý. Security and defence specialist and political consultant briefly turned Defence Minister in Topolánek’s first failed attempt at a minority government last year. Not to be confused with diplomat and former Foreign Minister in 1998 caretaker government Jaroslav. Naturally, they all claim that they agree on everything and no one could hold a cigarette paper between them…. This is either a very cunning plan by Prime MinisterTopolánek (not known for his interest in or knowledge of foreign affairs) to have a rather vague, mildly euro-sceptic foreign policy by default or a product of coalition bargaining and bargaining within the Civic Democrats. However, there, predictably was little earliy sign of compromise on the part of Zahradil and Klaus. Echoing Topolánek’s more restrainted putting across of the Czech position at a meeting with Merkel (Constitution in existing form is in same state as Monty Python’s “ex-parrot”).HN citing Euroosberver recounts that Zahradil and Klaus have already gone into action (or at least gone straight onto the record) in opposing Angela Merkel’s plans to revive the derailed Constitution making process. Zahradil uses the key phrase ‘Europe of Democracies’ – anyone who read the Minority Report entitled “A Europe of Democracies”which he and a handful of eurosceptic delegates drewadvicating a up before walking out of the European Convention can have little doubt what that means. I used occasionally to buy Prospect magazine until (a few years ago) until its cover price rose to the best part of fiver. You can read the odd Prospect article for free online, although as this month’s issue shows, it’s sometimes best not to bother. Timothy Garton Ash argues for a new narrative of European identity based on any alien “defining other” such as Islam or the US (think discourse theorists and other academic thinkers on identity would have a problem with that, I think) on the grounds that the European project has lost its way since the end of the Cold Way. His suggestion? A rather vague concoction of liberal values: freedom (spread of); peace (Europe no longer cockpit of world conflict); democracy (EU as promoter of); rule of law; prosperity (we are wealthier than our grandparents); solidarity (decent social-liberal compromises, not US style capitalism red in tooth and claw); diversity (not as boring as the US) and….wait for it, added self-criticism (we haven’t fully achieved any of the above but can improve). The above, explains, TGA, can be customized for national circumstances so there are multiple overlapping narrative. I am sceptical that there was a “political narrative that sustained the post-war project of (west) European integration” even during Cold War unless we talking only of/to political elites and intelligentsias (usually the case with TGA). The more prevalent narratives, I suspect, were anti-communism, national interest and outright fear. More broadly, although it’s hard to disagree with TGA, his writing is frankly soggy as old toast. Basically, he seems to offer a kind of dilute Euro-Whig story and it’s hard to see his call for a re-thinking of European identity (opened up for discussion on a purpose designed website) to yield more than vague musings of the kind that already fill reams of column inches. Francis Fukuyama has a piece on identity and migration in the same issue, which is better written and superficially more hard-headed, but offers a fairly familiar critique of (European) multi-culturalism: liberalism and liberal-democratic political systems were blind to the group claims and group identities (classes and ethnic groups) mainly because of highish levels of cultural cohesion. Some ethnic and religious groups that established themselves because of post-1945 migration barged into residual corporatist and consociation arrangements and – bolstered the multi-culturalism concept, which saw diversity as a kind of icing on the cake – started making demands incompatible with liberal values. The solution? Well, FF at first seems to suggest a kind liberal (secularist) revolution, which seems to imply a moving towards the US model (but hang on: isn’t the US more divided by “culture wars” driven by an assertive religious Right than Europe?) and – despite referring favourably to the German Christian Democrat notion of a Leitkultur (speedily dropped)- ducks the issue of whether this implies the imposition of a dominant national culture, rather than just some lightweight Garton Ash-eque narrative. Can’t help feeling we face a starker choice between liberalism without strong unifying identities and a more conservative-national project reining in liberal freedoms. Arch Czech Civic Democrat ‘euro-realist’, former ODS Shadow Foreign Minister and head of the party’s group in the European Parliament, Jan Zahradil gives an online interview to readers of the Czech centre-right daily Lidové noviny (‘Výslech Jana Zahradila’, 16 January). Both the questions and the answers are somewhat more substantive than the usual ranting/spin that these exercises usually produce, although Zahradil is suitably evasive and circumspect when he needs to be. He confirms PM Topolánek’s account that he declined the post of Foreign Minster in the first (unsuccessful) right-wing Green coalition formed immediately after last years elections but denies he was afraid to take on the post (as Topolánek claimed in a characteristic outburst), saying fairly that he would be ‘a red rag to a bull’ for Czech euro-enthusiasts (that’s the whole of the Czech political spectrum bar the Communists unfortunately for him); said that he had himself suggested Alexander Vondra as an alternative (who didn’t in the end get the post, but as consolation prize becomes Deputy Prime Minister for European Affairs, so will presumably exercise a moderate check of Schwarzenberg’s more independent, europhile inclinations – as a formidable independent he will hardly be accountable to the Green Party who nominated him); expressed regret that ODS finance spokesman and flat tax advocate Vlastimil Tlustý is not in the government and therefore not in the ODS leadership; refuses to speculate about Czechs membership of the eurozone but mentions speculation that Italy might drop out and adds that the CR will only join ‘when it is economically beneficial for us’ (not quite a textbook account of the acquis communautaire); stresses his liberal social views (pro-registered partnership law) to distinguish himself from Topolánek and duck a question about Topolánek’s criticism of Klaus’s ‘revivalist obsession’ (which he rather shares – yes, you can be a social liberal and a rampant Czech nationalist); rejects any of idea of a Christian Democrat/Civic Democrat /Social Democrat coalition (Topolánek was trying to broker one and his deputy and rival Pavel Bém was still more in favour); claims that he hasn’t left Czech politics as he is still in the ODS leadership, but denies that he took a place in the EP’s Development Aid committee, rather than the more high profile Foreign Affairs Committee to leave more time for politicking in the CR. Rather unconvincingly, he argued that the former was more important has it had a ‘budgetary capacity’ that the Foreign Affair committee. Pull the other one. > A Petya Federov, seemingly a Russian based in London, has thoughtfully posted an article (part 1 and part 2) on his blog about Putin’s Russia from the London Review of Books by veteran New Left intellectual Perry Anderson . Slightly to my surprise, Anderson clearly knows Russia and its politics and culture very well, although the reported ideas of Russian thinkers he is familiar with are rather more interesting than his own. Slightly conventionally, his focus is on the fate of Russia’s Western oriented liberal intelligentsia, who played such a prominent role in perestroika, allied themselves with Yelstin’s flawed reform coalition and were then marginalized – or corrupted – by the evisceration of the public sector, the rise of trash commercial culture and the semi-authoritarian ‘virtual politics’ embodied by the Putin era. Some well educated Russia (ex-?) intellectuals write detective stories (Boris Akunin) or serve in the legions of cynical, well paid ‘political technologies’creating the stage front for the grim pantomime of Russia politics. Oh horror. “ Fifteen years later, what has become of this [pro-Western, liberal] intelligentsia? Economically speaking, much of it has fallen victim to what it took to be the foundation of the freedom to come, as the market has scythed through its institutional supports. In the Soviet system, universities and academies were decently financed; publishing houses, film studios, orchestras all received substantial state funding. These privileges came at the cost of censorship and a good deal of padding. But the tension bred by ideological controls also kept alive the spirit of opposition that had defined the Russian intelligentsia since the 19th century – and for long periods been its virtual raison d’être.With the arrival of neo-liberalism, this universe abruptly collapsed. By 1997, budgets for higher education had been slashed to one-twelfth of their late Soviet level. The spectacle of this migration into a universe of shady banking and trading, ‘political technology’ (campaign-running and election-fixing) and public asset-stripping, in turn affected those left behind. Others, who had specialist scientific skills, got better jobs abroad. In these conditions, as the common values that once held it together corroded, the sense of collective identity that distinguished the traditional intelligentsia has been steadily weakened.The result is a cultural scene more fragmented, and disconnected, than at any time within memory. Outside, the Tverskaya with its boutiques and chain stores sets the tone. The culture of capitalist restoration looks back, logically enough, to the object-universe of late tsarism, whose garish emblems are everywhere. Moscow retains its autumnal beauty, even if as elsewhere – Weimar or Prague – too much new paint tends to coarsen older buildings rather than reviving them. But now it is enveloped in a smog of kitsch, like ancient regalia buried within a greasy wrapper. The city has become a world capital of bad taste, in which even the postmodern can seem a caricature of itself. All this physical trumpery reflects the dominant landscape of the imaginary. Within a few years, Russia has spawned a mass culture fixated on postiche versions of the dynastic past. The country’s most successful author, Boris Akunin, writes detective novels set in the last third of the 19th century. Among other stirring deeds, his upright hero Erast Fandorin thwarts a plot to hold the coronation of Nicholas II to ransom.The poverty of all this retro-tsarist culture reflects the impossibility of any meaningful repossession of the world of the Romanovs. The old order incubated a rough-hewn capitalism, but itself remained patrimonial to the end, dominated not by merchants or industrialists, but nobles and landowners. No living memory connects with this past: it is too different, and too remote, from the present to serve as more than vicarious pap. The Soviet past, on the other hand, remains all too immediate, and so in another way unmanageable. With few exceptions, the intelligentsia repudiates it en bloc. The population, on the other hand, is deeply divided: between those who regret the fall of the USSR, those who welcomed it, and those – perhaps the majority – whose feelings are mixed or ambivalent. The Soviet Union was not the Third Reich, and there is little sign of any Vergangenheitsbewältigung along German lines. In the culture at large, the tensions in social memory have produced a patchy amnesia. Economically, culturally, psychologically, the Russian intelligentsia has been pulled apart by the changes of the last fifteen years. The term itself is now repudiated by those for whom it smacks too much of a common identity and a revolutionary past: contemporary intellectuals should shun the suspect traditional term intelligent in favour of the neologism intellektual, of healthier American origin, to denote the new independent-minded individual, distinct from the collective herd of old. Such dissociations themselves have a long history, going back at least to the denunciations of the radical intelligentsia by Vekhi, the famous symposium of writers on the rebound from the 1905 Revolution, who might now be called neo-conservative, but were then nearly all liberals. Today, vigorous questioning of the self-images of the contemporary intelligentsia can be found across the spectrum, but attacks on its historical role again occur mainly in liberal journals – the debate in the autumn in [critical intellectual journal] Neprikosnovenny Zapas is an example. But their context has altered. The events of 1991, not those of 1905-7, constituted the first revolution liberals could call their own. Politically, how then does Russian liberalism stand today?Hostility – often, in private, verbally extreme hostility – to Putin’s regime is widespread. But of public opposition there is little. The reason is not only fear, though that exists. It is also the knowledge, which can only be half-repressed, that the liberal intelligentsia is compromised by its own part in bringing to being what it now so dislikes. 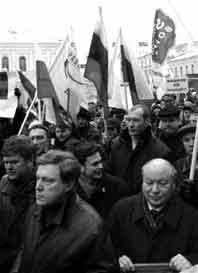 By clinging to Yeltsin long after the illegality and corruption of his rule was plain, in the name of defence against a toothless Communism, it destroyed its credibility in the eyes of much of the population, only to find that Yeltsin had landed it with Putin. Now, with a mixture of bad conscience and bad faith, it struggles to form a coherent story of the change. It was clear from the very beginning of the August overturn that a test of the new Russian liberalism would be its handling of the nationalities question, where the old – Vekhi and its sequels – had conspicuously failed. During the first Chechen War, it acquitted itself honourably, opposing Russia’s invasion and welcoming its acceptance of defeat. But the second Chechen War broke its moral spine. A few protests continued, but by and large the liberal intelligentsia persuaded itself that Islamic terrorism threatened the motherland itself, and had to be crushed, no matter what the cost in lives. A year later, America’s own war on terror allowed a gratifying solidarity with the West. Today, few express much enthusiasm for the Kadyrov clan in Grozny: most prefer to avoid mention of Chechnya. Leading courtiers of Yeltsin, still flanking or advising Putin, are more outspoken. Gaidar has explained that it is difficult for outsiders to understand ‘what the aggression against Dagestan in 1999 meant for Russia. Dagestan is part of our life, part of our country, part of our reality’ (sic – Russians make up 9 per cent of the population). Thus ‘the issue was no longer the Chechen people’s right to self-determination. It was the question of whether Russian citizens should be protected by their own government.’ Chubais has been blunter: Russia’s goal in the new century, he recently declared, should be a ‘liberal empire’.Such views are naturally welcome enough in the Kremlin, though these particular voices are something of a liability. Around the regime, however, are more credible forces, recruited from the democrats of 1991, who provide it with critical support from a distinctive position within the liberal tradition. Grouped around the successful weekly Ekspert – a business-oriented cross between Time and the Economist – and in the back-rooms of United Russia, their outlook could be compared to Max Weber’s in the Second Reich. The fall of the USSR was, they believe, the work of a joint revolt by liberal and national (not just Baltic, Ukrainian or Georgian, but also Russian) forces. But under Yeltsin, these two split apart, as more and more Russians with a sense of national pride felt that Yeltsin had become a creature of the Americans, while liberals remained bound to him. Putin’s genius, in this version, has been to reconcile national and liberal opinion once again, and so create the first government in Russian history to enjoy a broad political consensus. The market-fundamentalism and retro-Communism of the 1990s, each now a spent force, are no longer alternatives. In bringing calm and order to the country, Putin has achieved ‘hegemonic stability’.By their own lights, the intellectuals who articulate this vision – typically from scientific or engineering backgrounds, like many novelists – are clear-eyed about the limitations and risks of the regime, which they discuss without euphemism. Putin’s style is to give concessions to all groups, from oligarchs to the common people, while keeping power in his own hands. He is ‘statist’ in every instinct, despising and distrusting businessmen; though he does not persecute them, he affords no help to small or medium enterprises, so that in practice only the huge raw materials and banking monopolies thrive. Politically, he is a ‘presidential legitimist’, in a Congress of Vienna sense, and so will respect the constitution and step down in 2008 – after choosing his successor. Those who have cast their lot with hegemonic stability risk repeating the trajectory of the original liberal intelligentsia under Yeltsin, who kept thinking that their advice and assistance could steer him in the right direction, only to find that he gave them Putin, under whom they tremble. Unable to come to terms with their own responsibilities in backing the attack on the White House and the fake referendum on the constitution, with all that followed, they are now reduced to complaining that a ruinously Sovietised Russian people have proved incapable of accepting the gift of democracy ‘we were striving to bring them’. Today’s national-liberals are more lucid than the democrats of the 1990s, but it is not clear that they have much more real influence at court than their predecessors. If one of the candidates they most fear – the defence minister, Sergei Ivanov, or even the pallid premier, Mikhail Fradkov, for example – were to be put into the Kremlin, they could find themselves in much the same situation as the limpets of Yeltsin. They hope it will be someone more amenable, like Putin’s other favourite, the first deputy premier Dmitri Medvedev, whose task is to give a socially caring face to the regime. But they will have no more say in the choice than other citizens.Historically, Russian liberalism came in a variety of shades, and it would be wrong to reduce them all today to the pupils of Hayek or Weber. Amid the different adaptations to power of the period, one mind of complete independence stands out. Tall but stooped, almost hunched, with the archetypal bookish look of a scholar, in a square, squinting face lit up with frequent ironic smiles, the historian Dmitry Furman is of White and Red descent. His grandmother, who brought him up and to whom he was always closest, was an aristocrat, his grandfather – the couple were separated – a high Stalinist functionary, who even as a deputy minister lived quite poorly, devoted to his cause and work. Furman explains that he grew up without any Marxist formation, yet no hatred of Communism, regarding it as a new kind of religion, of which there had always been many sorts. After graduating, he did his research on religious conflicts in the Late Roman Empire, and then became a specialist in the history of religions in the Academy of Sciences. He never wrote anything about contemporary events, or had anything to do with them, until perestroika.When the USSR collapsed, however, he was virtually alone among Russian liberals in regarding the overthrow of Gorbachev as a disaster. For a year afterwards, he worked for the Gorbachev Foundation, and then returned to the Academy of Sciences, where he has since been a researcher at the Institute of Europe, and a prolific essayist on the whole zone covered by the former USSR. He has perhaps the most worked out, systematic view of post-Communist developments of any thinker in Russia today. It goes like this. The country is a ‘managed democracy’: that is, one where elections are held, but the results are known in advance; courts hear cases, but give decisions that coincide with the interests of the authorities; the press is plural, yet with few exceptions dependent on the government. This is, in effect, a system of ‘uncontested power’, increasingly similar to the Soviet state, but without any ideological foundation, which is evolving through a set of stages that parallel those of Russian Communism. The first phase sees the heroic destruction of the old order, a time of Sturm und Drang – Lenin and Yeltsin. The second is a time of consolidation, with the construction of a new, more stable order – Stalin and Putin. The leader of the second phase always enjoys much broader popular support than the leader of the first, because he unites the survivors of the original revolution, still attached to its values, and the anti-revolutionaries, who detested the anarchic atmosphere and the radical changes it brought. Thus Putin today continues Yeltsin’s privatisations and market reforms, but creates order rather than chaos. The successor to Putin in the third stage – comparable to Khrushchev – is unlikely to be as popular as Putin, because the regime, like its predecessors, is already becoming more isolated from the masses. Putin’s high ratings in the polls are entirely a function of his occupancy of the presidency: the rulers of Kazakhstan or Azerbaijan – Nazarbaev or Aliev – can match them, because their systems are so similar. Might not nationalism provide such a basis [for regime renewal after Putin], if it is not already doing so? Furman dismisses the possibility. Russian nationalism is too low-powered to take the place of democracy as a legitimation of Putin’s rule. It is not a fanatical force like the nationalism that sustained Hitler’s regime, rather an impotent resentment that Russia can no longer bully its neighbours as it once did. The current campaign against Georgians is an instance: an expression of the frustration of a former master-people, that has now to treat those who were once its inferiors as equals. The result is a pattern of sudden rages over minor issues, explosions that are then as quickly forgotten – disputes with Ukraine over this or that dam, clamours over Serbia, and so on. These are neurotic, not psychotic symptoms. Such petty rancours are not enough to found a new dictatorship. That is why legitimation by the West remains important to the regime, and is in some degree a restraint on it. Since it has no ideology of its own, and cannot rely on a broken-backed nationalism, it must present itself as a specific kind of democracy that is accepted by the G7 – Russia as a ‘normal country’ that has rejoined Western civilisation. Anderson then goes on to review Alena Ledeneva’s How Russia Really Works, whose conclusions he finds too sanguine, and Andy Wilson’s Virtual Politics which he finds ‘searing’ and slightly more to his taste, although this sits rather oddly with his earlier argument that we should examine Russian society more than the state. He finishes by noting Russia’s demographic crisis and the country’s unpredecented geo-political weakness in facing a strong EU to the West and a rising China to the East. On the other hand, Will Hutton predicts trouble for China and the CIA research has seriously entertained the break-up of the EU’s semi- confederal system as a contingency to be considered, so perhaps Putin’s successors will have the last laugh. Certainly, they’ll have enough gas and oil to keep the lights on. >CEE public opinion: trust me, I’m a … Polish policeman? It is perhaps unsurprisingly that Courts are strongly trusted in Hungary and but have low trust in Slovakia – Hungary’s courts had a greater degree of independence under later communism, while Slovakia’s were weak, I suspect, under great political pressure under Mečiarism. However, the newly elected left-wing Slovak populist government enjoys is the highest in any of the four states – as the Czech government had not won a vote of confidence in December it was not included (although, as expected, it has just squeaked through thanks to tacit support from two deputies who have quit the opposition Social Democrats). No surprise that the Catholic Church is trusted in Poland and not really trusted by the more liberal, secular Czechs. Local authorities enjoy quite good rating across the whole of the V4. The police enjoy surprisingly high rates of trust in Poland and Hungary and much less in the Czech Republic and Slovakia – something that fits in with Anna Gryzmala Busse’s ideas about the greater politicization of the state in the latter two (although she doesn’t include police reform in her survey of state reforms). Polish President Kaczynski is less trusted than this counterparts in the rest of the V4, probably because he is seen as partisan and a divisve but a large section of Polish voters. Clearly Václav Klaus, who despite his other failings, has managed the trick could clearly teach him a thing or two. Political parties are, predictably the least trusted institutions surveyed, although they are strikingly distrusted in Poland and the Czech Republic and distrusted by ‘only’ ¾ of respondents in Slovakia and Hungary. This is a little difficult to make sense of as Hungary and the CR have fairly stable party systems and Slovakia and Poland very fluid and unstable ones. I guess one would need to check long term trends to see if recent Czech and Polish political shenanigans have impacted on public opinion, but a quick think through recent events in Hungary and Slovakia does suggest that these countries politician really come up smelling of roses. Overall only Hungary, top politicians and parties excepted, seems to score well in terms of institutional trust across the board, although I guess I should tot up the figures. Contrary to many expectations (mine included) Czech PM designate and Civic Democrat leader Miroslav Topolánek has pulled it off and done a deal with two maverick Social Democrat deputies, who left their party’s parliamentary faction last year. The pair will not support his Green/Christian Democrat/Civic Democrat coalition, but will ‘tolerate’ it by not voting against it in a vote of confidence. This should produce a 100-98 vote in favour, assuming the coalition deputies all hold to the deal (likely), despite rumblings of discontent about the bad deal Topolánek negotiated with the two junior coalition parties and the ruffled feathers of numerous big cheeses in ODS – Jan Zahradil and Finance spokesman Vlastimil Tlustý (not included in the cabinet), for example. The vote of confidence yet to take place as President Klaus – who opposed such a deal in favour of Grand Coalition with workable majority – has yet to formally appoint the government may yet try to throw a spanner in the works. 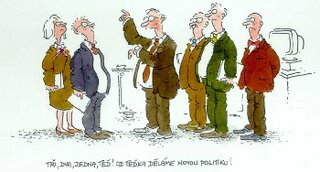 In exchange, the ‘constructive’ ex-Social Democrats do get something: a formal declaration specifying some policy concessions (the most concrete a promise to legislate for non-profit hospitals – a bulwark against privatization – and some vaguer promises about tax reform not raising the burden on any group and retaining the principle of targetted social benefits) and…. well, who knows? The Social Democrats are understandably outraged as the two ‘deserters’ or ‘defectors’, depending on your translation (přeběhlíci) – or, indeed as the right calls them ‘constructive deputies’ – were elected on a party list, rather than for individual merit and are crying corruption. There must indeed be some suspicion that the two have been personally bought off. There have been persistent, if unproven, allegations that the Civic Democrats under Topolánek have tried to induce individual deputies in other parties to defect – the case of Freedom Union deputy Zdeněk Kořistka, whom a Topolánek aide allegedly tried to bribe with (I think) 10 million crowns in 2005 and alleged approaches to Social Democrat deputy (and ex-ski jump champion) Pavel Ploc after last year’s elections come to mind. The Kořistka case was inconclusively investigated by the police – surveillance tapes from the investigation were mysteriously leaked during last year’s election campaign. On the other hand, the Social Democrats are highly factionalised and have a history of deputies breaking away to become independents and doing deals with the right when they feel their party is being too intransigent – the cases of Tomáš Teplík (who moved to ODS) and Josef Wagner in 1996-7 come to mind. If the Civic Democrats have any nous, no cash or property will change hands, but a lucrative appointment for the two ex-Social Democrats will soon materialise. An alcoholic ODS deputy . Josef Kott, expelled from the party for being drunk in parliament – thank God the Czechs have some kind of standards, as the experience of picaresque Tory diarist Alan Clarke this kind of thing was traditionally excusable in the House of Commons – stepped down (allowing a replacement from the party’s electoral list) and was soon after appointed to a executive post in the state run General Health Insurance (VZP). No wonder the Czech health service is not in a good state. If all this shows anything – apart from the fact that Czech politics is deadlocked, which we’ve known for a decade – it isthat Topolánek, despite being one of the most accident prone politicians in the Czech Republic, is a man who is lucky. Indeed, as the 2002 ODS congress was midway through electing a replacement for Klaus, his (ex-)wife Pavla rushed up to the podium and told delegates in an excruciating improvised contribution that they should back him precisely for this reason. > My daughter has become an aficionado of snakes and ladders and soon I know every last nuance and variant of its random ups and downs – there’s about a one in four hundred probability of winning in four goes by climbing up successive ladders. Listening to the radio in the kitchen I hear Aidan Hartley’s excellent Radio 4 documentary describe the coup-ridden politics of West Africa as a game of snakes and ladders, seeing junior officers propelled to high office and propelled out equally fast, although Ghana’s Jerry Rawlings emerges as great survivor. A related point is made by Mark Blyth in the latest issue of American Political Science Review, who argues that Comparative Politics as a sub-discipline has been too fixated with a basically predictable world of known risk, rather than rampant uncertainty where the mechanisms of change are not clear to us. For this reason comparative political scientists are periodically whacked over the head by unexpected events (rise of fascism, collapse of communism, 9/11 etc) and end up doing a major paradigm shift producing a ‘great punctuation’. Basically, he says we are playing snakes and ladders, but never know quite how many dice we are rolling or how many sides they might have .… Slippery business, politics. Mark Blyth ‘Great Punctuations: Prediction, Randomness and the Evolution of Political Sciences’, American Political Science Review, 100 (4): 493-98. >Reform in post-accession CEE: long unwinding road? > I get to chair an interesting seminar presentation from Prof Geoffrey Pridham of Bristol University at SSEES on post-accession ‘conditionality’, although as transpired from presentation and questions this might be better thought of as monitoring or transparency via a large number of different actors (European parliament, local media and NGOs, domestic oversight institutions set up to meet the acquis but now flexing their muscles, rather than the formal, bureaucratic oversight of the European Commission seen in the accession process. The big question is if (and how) the reforms (supposedly) enforced by the EU conditionality will unwind. The coming to power of the populist-nationalist government of Robert Fico in Slovakia and the similarly extremist backed minority coalition formed in Poland seemed a sign of such unravelling, although Geoffrey’s stress was on more on the culture, values and commitment of local elites than electoral politics. In this perspective generational turnover – indeed any kind of turnover of communist-era elites in the judiciary and elsewhere – is a key mechanism of change. Sketching out hypotheses for the fate of EU backed reforms (institutional inertia; path depednet-style lock-in; social learning; domestic pressures for rollback) he paints a mixed picture based on the experience of Slovakia and Latvia, where – according to much conventional academic wisdom – the pressures exerted by the EU during accession process displaced the illiberal democracy of Vladimír Mečiar and dampened down the inherent potential for ethno-national conflict in a society where some 30 per cent of the population is composed of Russophone minorities. For me the most interesting aspect of the talk was the way it filled the post-accession hiatus with some structured ideas and hypotheses about the EU-domestic politics relationship and, in particular, its view of elites and outcomes as more important than formal institutional building per se in the post-accession domestic arena. Here Geoffrey seems close to the ‘elite network state’ concept of Anton Steen, rather than the checklist of formal institutions set up to meet the acquis (used by Anna Gryzmala-Busse in her (admittedly differently focused) work on politicization of the post-communist state). In truth, ‘euro-realists’ like Václav Klaus could be found arguing for the need to customize the acquis well before accession and questions have been asked as to whether conditionalitiy was in, fact, not a myth. Wade Jacoby’s innovative study of different policy sectors highlights the uneven nature of the acquis, conditionality and implementation and studies of regionalization – admittedly, a hot (well, warm) topic in the region before accession got going have stressed how the acquis was simply instrumentalized and/or potemkinized in ongoing domestic struggles. Here James Hughes, Gwendolyn Sasse and Claire Gordon’s Europeanization and Regionalization in the EU’s Enlargement to Central and Eastern Europe : the Myth of Conditionality (Basingstoke : Palgrave Macmillan, 2004) is well worth a shufti. 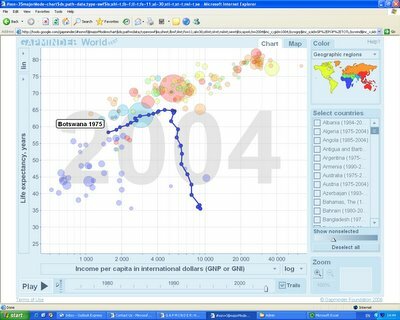 I checked out the impressive animated statistics presentation programme Gapminder developed by the Swedish public health and development researcher Prof Hans Rossling. Although the site proclaims its commitment to open source software and positively urges you to download its tools, it seems mainly to house demonstrations of particular sets of stats and earlier presentations done by the Gapminder team. Most, unsurprisingly, concern health and development issues graphically illiustrated with interactive animations of socio-economic and demographic data – I was rather disappointed, however, that it wasn’t more straightfoward to load up your own data and run it on Gapminder – I couldn’t make head or tail of the link to Google – and that there didn’t seem to be any political variables like, say, Freedom House human rights ratings. Still, its’s impressive and arresting – see above my tracking of Botswana’s life expectancy and aveage income score: although one of the success stories of African development (a relative concept, of course), life expectancy crashes through the floor around 1990s due to the impact of AIDS despite a doubling of income. >Czech politics: all over soon for Topolánek? The Civic Democrats’ political soap opera (‘an everyday story of right-wing political folk’) rumbles on. Party leader Miroslav Topolánek, having sprayed some rather ill considered invective at opponents and critics in his own party (including honorary party Chairman, President Klaus) dissatisfied at the less than advantageous deal he cut with smaller parties in agree a second minority government – and this government’s less than good (actually close to nil) chances of making it through the required parliamentary vote of confidence, has now said he will (offer to) resign as party leader if he doesn’t win the vote. He has alienated so many in his own party – the influential first deputy chair and mayor of Prague Pavel Bém his flat tax supremo, his finance spokesperson and former right-hand man Vlastimil Tlustý, whose abilities he compared unfavourably to discredited ex-Christian Democrat leader (and Finance Minister designate) Miroslav Kalousek; foreign policy guru, arch-eurosceptic and head of the ODS MEPs, Jan Zahradil; and of course, pan prezident, His Excellency Václav Klaus. Despite promising to vote for the government, ODS deputies seem mightly discontented, a few like party favourite and (former?) social affairs spokesperson Alena Páralová are more or less openly saying they would have problems voting for Topolánek’s second dead end effort at forming a minority administration. The mood in the party seems to be that if – perhaps when – he blows he again they will take him up on his generous offer and not beg him to stay. Topolánek, however, has other problems. Czech media have just (co-incidentally?) got hold of the story that the ODS leader is living with fellow ODS deputy Lucie Talmanová (picture right), whose relationship with Topolánek triggered the break-up of his marriage last year, leading Mrs Topolánková into a foray into politics standing against ODS in last year’s senate election (she was eliminated in the first round of voting, but ODS lost the seat). The couple are not denying reports that Talmanová is expecting a baby, although Topolánek is reported by the Czech tabloid press (sadly tame by British standards, alas) to have spent parts of the Christmas holiday with both women, but to have been accompanied by Mrs T. to an official dinner with President Klaus – what an occasion that must have been – and there are apparently no plans for a divorce. The politics of this seem to be that there is a fairly nasty factional struggle developing within ODS and the gloves are off. 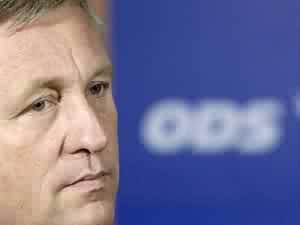 Topolánek had already been warned he faces a second “Sarajevo” – an internal party revolt by top leaders analogous that that brought down Klaus as PM in December 1997 and the revelations about his private life – that paint him as unreliable, indecisive, accident prone, distracted and just plain sad and middle aged – suggest that the plotters against him mean to finish him off with rather ruthlessness than the incompetent, half-cocked move against Klaus in 1997. Klaus himself is taking is time with nominated a government – officially waiting for the ministers’ full CVs – presumably to allow things to unwind for Topolánek. More fundamentally, having gone flat out for flat tax and market forces in 2006, what would the Civic Democrats actually stand for if they can happily sit in the same government as the Social Democrats? Would they simply become the (neo-)liberal pillar in some Czech form of Dutch or Belgian style consensus democracy based on variants of left-right co-operation? Petr Nečas, the leading voice of US-influenced social conservatism in ODS, warned against such a future in 2002 when making his own bid for the party leadership, advocating a kind of Hungarian style ctach-all national-populism to win a majority for the right. The speech lost him the election andlater threw in his lot with Topolánek. Perhaps he is the joker in the pack. Another intriguing question hovering in the background is what happen to the wily Zahradil and ODS’s rampant and well developed ‘euro-realism’? Zahradil and many ODS eurorealists – not least President Klaus, who does his own line in euroscepticism (big vision, ‘Europeism’ as a new anti-liberal, anti-national ideolofy) are rather favourable to the idea of a Grand Coalition, thinking that it could be a useful vehicle for refocusing Czech politics on the promotion of national interests in Europe and (presumably) that they will convert europhile coalition partners to their point of view. In practice, however, the logic of a Grand Coalition implies compromise on European policy and no early recall to domestic politics for Zahradil, whose euroscepticism is totally indigestable for the europhile Social Democrats and Christian Democrats. His chances of becoming Foreign Minister seem slim and as a Pražák himself now part of the Euro-elite he despises, he is hardly well placed to set himself as a Man of the People standing up for the provincial heartlands against the metropolis. Still, he is still in the political game and that’s what counts. The same may soon not be true of Topolánek, whose political career rise to the top has for me always resembled some small town football club unexpected promoted to the Premier League, hanging on spiritedly for a couple of seasons before facing a rapid and inevitable drop when their luck runs out.